Scoliosis is the lateral (sideways) curvature in the normally straight vertical line of the spine. Dependent on the degree of curvature and time of growth remaining, bracing may provide temporary correction. Those with severe curvature may consider surgery. The goal is to make sure the curve does not get worse. Neuromuscular Scoliosis. A result of abnormal muscles or nerves. Frequently seen in people with spina bifida or cerebal palsy or in those with various conditions that are accompanied by, or result in, paralysis. Degenerative Scoliosis. This may result from traumatic (from an injury or illness) bone collapse, previous major back surgery, or osteoporosis. Idiopathic Scoliosis. 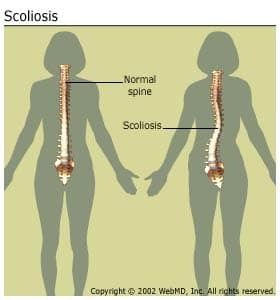 The most common type of scoliosis. There is no specific identifiable cause. Provide detailed descriptions of the signs and symptoms, if any are present. List of medical problems, including family history medical problems.